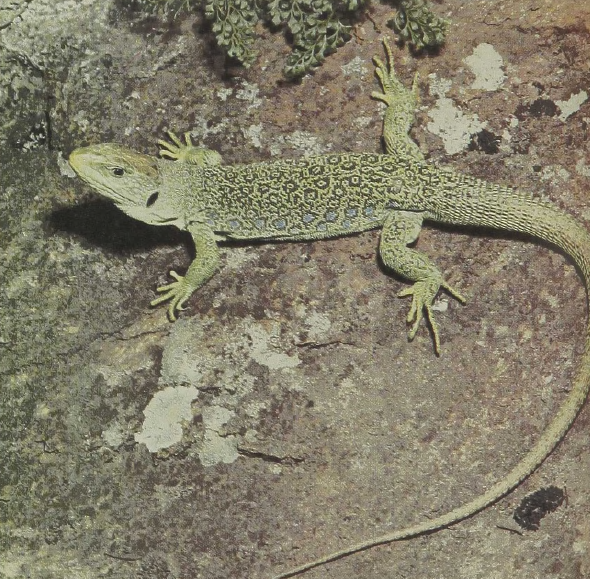 Lacertas are ground lizards of various sizes that are often excellent runners and climbers over rocks and sand. Their color varies from blacks and brown into greens and sometimes, as in the jeweled species of the Mediterranean area, with blue portholes. These lizards have a complex mating behavior which has been studied extensively, and related species lay eggs or bear live young. One member of this group ranges north of the Arctic Circle. Many of the small islands of the Mediterranean and Adriatic are inhabited by characteristic forms, and this situation has provided another natural, laboratory of speciation similar to that represented by the anoles in the Americas. Lacertas are diurnal and remarkably adapted to varied conditions in relatively small areas. At almost 30 inches, the Jeweled Lacerta is one of the largest among the Lacertidae.